Click on the image to open a 3D .pdf version. Those of you who started out on my R2D2 pages are aware that I designed a Box Beam Leg, and that I made a design error when I did the design. 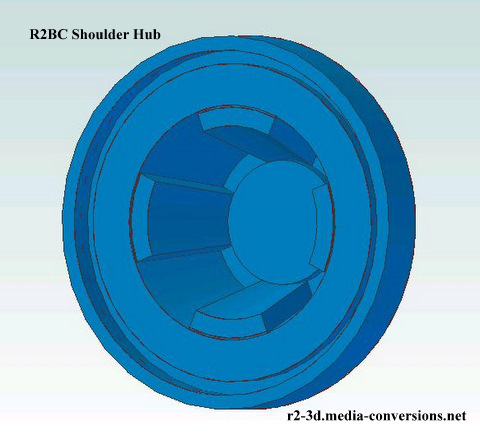 While that error has been corrected, there is no way to change the fact that there isn't enough space in the mounting area for the standard R2BC spec Shoulder Hub. There's only 1.5 inches available on the inside of the shoulder hub mounting area. In that space are the 1/4-20 bolts, washers & nuts that hold the leg to the 3-Leg Fixed (or 2-Leg Fixed) Shoulder. A 1/4-20 washer [Crown Bolt #19822, pkg of 100] is typically .055 thick - I'm using .06 in my calculations. A 1/4-20 nut [Crown Bolt #08420, box of 100] is typically .215 - I'm using .22 in my calculations. Presuming you've filed the bolts down so they are flush with the top of the washer & nut. A club Spec Shoulder Hub is 1.312 deep. Here's the math: 1.312 + .06 + .22 = 1.598 or .098 too big! I'm a perfectionist, having a shoulder hub that's sitting almost .1 inch higher that the surface of the leg is not good. Now, as bad as things seem, All is not lost. 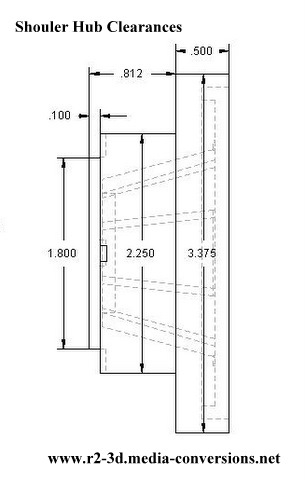 This is a cross section drawing of the Shoulder Hub shown on the right. What I'm trying to illustrate is that there's a lot of dead space in the bottom outside edge of the shoulder hub. Here is a version of the Shoulder Hub with a .1 edge removed from the bottom to enable it to clear the mounting bolt circle. In addition, I've added 4 holes suitable for installing .125 in. magnets to hold the hub in place. 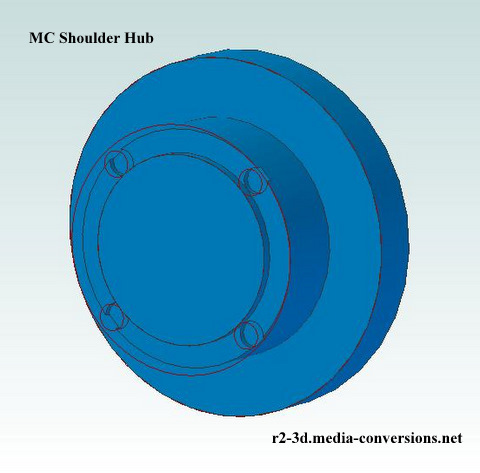 You can download drawings, in Autocad .dwg and Adobe .pdf format, of the Shoulder Hub rear surface showing the dimensions of the modification here. Note: while the drawings show there's more than enough clearance to make these modifications, you do so at your own risk.